If you are selling a larger, higher value home you should contact Compass Executive Homes. Compass' large and attractive Residential, Executive, New Homes and Lettings showrooms sit in prominent position. Combined, they offer one of the largest window frontages in the area, providing a high profile for all advertised properties and attracting large numbers of visitors. Operating from a proactive viewpoint and with long opening hours, seven days per week, you can be sure that Compass will make every effort to expose your property to the widest possible market. At the same time, accompanied viewings and regular feedback reduce the stress of selling your home. 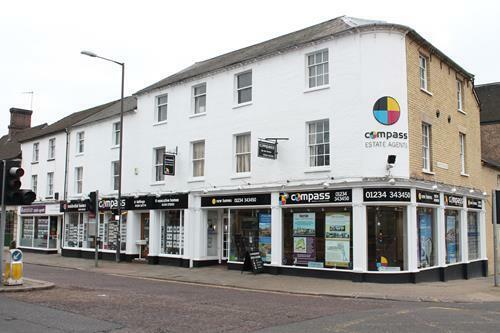 When you are looking to sell your home choose Compass, the complete estate agency. Call today and make the right move. When you are buying or selling land with planning permission or with the potential for development, contact Compass. Our professional staff are experts in sales, purchase and acquisition and can advise on any size of site, from an individual plot to large acreage. Offering a complete service for developers, Compass works to identify potential sites, liaise with architects, solicitors and other construction consultants, assist with planning and inquiries and negotiate with local authorities. Compass Land & Development is conveniently based in Compass Group headquarters in the centre of Bedford, alongside our residential and executive homes divisions. This central position enables us to work throughout the country on behalf of many clients. When you need help with land acquisition and sales, instruct the agent that gives you a complete service. Successfully marketing a development of new homes takes a great deal more than luck. Attracting the right purchasers is a skill and you must ensure you choose a team of dedicated sales people who understand the market and use professional sales techniques. Compass has years of experience in the sale of new home developments, from small properties to large developments. Each require a different style of approach, dictated by price and location. Developments are marketed using a combination of media, from local newspapers to dedicated pages on the World Wide Web. Colour brochures incorporate artwork to give an accurate reflection of the proposed completed layout and include details of local amenities and attractions, which are all too often the deciding factor in a purchase. The exclusive new homes centre, situated in the centre of Bedford, has a spacious corner showroom with extensive window frontages. Open seven days a week it is ideally placed to advertise developments to their full advantage to a large audience of passing pedestrians and motorists. Compass offers a complete service to all developers, whether you are selling five or fifty homes; from initial brief to completion of the last sale, our staff will take a proactive role to ensure the success of the project. Regular reporting keeps you informed of progress. When you are planning a new development, make all the right moves and talk to Compass. Between 1.25% and 1.75% plus vat for sole agency dependent on the property type.